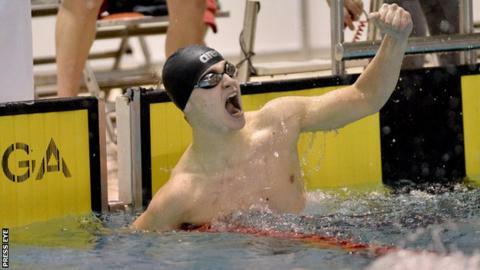 Larne swimmer Conor Ferguson clinched his second silver medal at the European Youth Olympics in Tbilisi on Friday. Ferguson, 15, took silver in the 200m backstroke final to add to the 100m medal he won on Tuesday. The Irish team member clocked 2:03.21 in the final after qualifying sixth with a heat swim of 2:05.83. Ferguson's team-mate Dubliner Ellen Walshe then clinched 100m butterfly silver which completed an impressive haul of five medals for the Irish team. Ireland's other medals came from Antoinette Neamt who picked up a 400m freestyle silver and 800m freestyle bronze. Tallaght swimmer Niamh Coyne took almost two seconds off her personal best to finish sixth in the 200m breaststroke final in 2:37.83. In this morning's heats Emma Moloney touched in 2:44.18 in the 200m breaststroke and Robert Powell concluded the week with a 2:14.20 in the 200m butterfly swim. Rebecca Reid clocked 2:10.12 in the 200m freestyle while Jack McMillan swam the 1500m freestyle in 17:04.88. Ireland's 400m medley relay of Rebecca Reid, Niamh Coyne, Ellen Walshe and Antoinette Neamt just missed out on the final by six tenths of a second after finishing ninth in 4:25.74.